Campus Compact of Oregon Supports Higher Impact Education! Thalia Garcia-Aguilar (she/her/hers) is a first generation Mexican-American. Her parents both immigrated from Mexico and made Hillsboro, OR their home where Thalia was born and raised. Her pronouns are she/her/hers. Thalia attended Warner Pacific University for her B.S. in Social Entrepreneurship. During her undergrad she was involved in student leadership where she helped organize events and activities around racial justice issues. Thalia also holds a Master's in Educational Leadership from Concordia University. Thalia first became involved with Campus Compact as a Summer VISTA in 2016 which lead her to become an AmeriCorps VISTA member in 2016-2017. 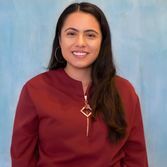 Thalia currently works as the AmeriCorps VISTA Leader in Communications for 2018-2019. Her goals for this year include elevating and centering historically marginalized people and moving towards racial justice and equity.